Maybe you’ve seen collagen advertised in food, skin cream, pills, or powders. The word is spreading about this nutrient important for a healthy, vibrant body. But collagen isn’t anything new. You’ve been making it your whole life. Collagen is a type of protein found in your muscles, bones, tendons, ligaments, organs, blood vessels, skin, intestinal lining, and other connective tissues. Most of the protein in your body is collagen. So, why the need to promote collagen on store shelves? Is it something you should be buying? Not necessarily. First, consider if your body is already making enough collagen on its own. There is no blood test or other way to measure the amount of collagen in your body, but you can tell when your body doesn’t have enough. Skin loses elasticity. You form wrinkles and your wounds heal more slowly. Tendons and ligaments are stiffer. You lose flexibility. Muscle mass decreases. You become weaker. Cartilage wears down. You develop joint pain or osteoarthritis. Intestinal lining gets thinner. You may have more digestion problems. Aside from aging, however, the top reason people don’t have enough collagen is poor diet. Your body can’t make collagen if it doesn’t have the necessary elements, namely amino acids and the nutrients to process them. To make collagen—or any protein—your body combines amino acids. You can get amino acids by eating and digesting protein-rich foods, like meat, beans, and dairy products. Then your body can repurpose the amino acids into collagen. During that repurposing process, your body uses vitamins and minerals, specifically vitamin C, zinc, and copper. These nutrients are part of a typical, healthy diet. You may consume plenty of them naturally in the foods you eat. Citrus fruits, red and green peppers, tomatoes, broccoli, and greens supply vitamin C. Meats, shellfish, nuts, whole grains, and beans are good sources of minerals. As you age, however, your body may no longer absorb nutrients as well or synthesize them as efficiently. To make sure your body has enough ingredients to make collagen, you may need to change what you eat or take dietary supplements. The best way to replenish the nutrients your body needs to make collagen is through your diet. Eating animal products, like beef, chicken, fish, and eggs will provide the amino acids. So will beans and legumes, but one of the best foods for building collagen is bone broth. You can buy it in grocery stores or make it yourself. 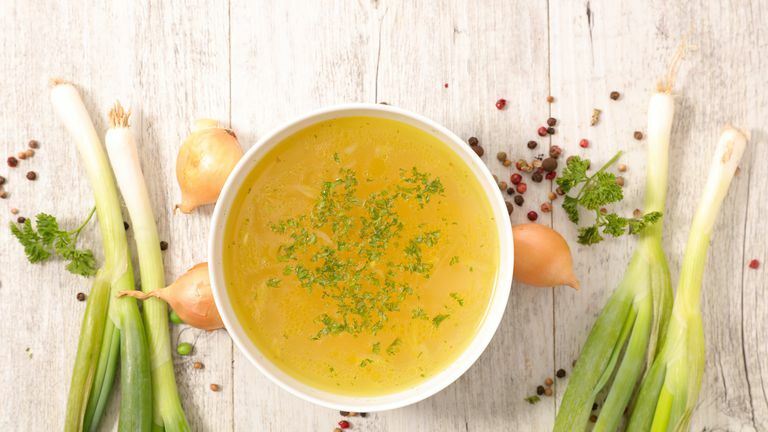 Bone broth extracts the collagen from beef, chicken, or fish bones through a low, slow brewing process. Good recipes are plentiful. Most will involve simmering bones in water for 12 to 48 hours either on the stove or in a crockpot. If you can, try to buy organic bone broth—or cook broth from the bones of only organically raised animals. You want to minimize the residue of pesticides, antibiotics and other contaminants in your broth. Gelatin is another great food to boost your body’s ability to make collagen. Gelatin comes from collagen, so it naturally has what your body needs to turn it back into collagen form. Getting nutrients from eating fresh, organic foods is best. It’s what your body is made to consume and digest naturally. But collagen supplements are second best and still a good source if you’re traveling, eating on the run, or otherwise concerned that your diet isn’t as nutritious as it could be. If you want to take a collagen supplement, opt for the powder form. Hydrolyzed collagen (or “collagen peptide”) powder usually has no flavor and dissolves easily in beverages, smoothies, soups, and sauces. Some skin creams claim to contain synthetic collagen to help revitalize your skin. They may work by adding a film-like layer to your skin to reduce water loss and protect your skin from environmental elements. But don’t forget that your skin is your body’s largest organ. And a proven way to keep your organs healthy is with good nutrition. Your skin is an outer reflection of your inner health, so it makes sense that the same way you nourish collagen stores throughout your body will nourish your skin too. Note, however, that the number one cause of skin damage isn’t lack of collagen. It’s sun exposure. Replenishing collagen may not be able to undo years of sun damage. If your body has ample stores of collagen, then you are increasing your likelihood of having firmer skin, smoother-moving joints, and other signs of a healthy, youthful body. The surest way to help your body produce collagen is by feeding it enough protein and other nutrients. It can be as easy as drinking one cup a day of bone broth or another beverage mixed with hydrolyzed collagen powder. Dr. Bradley is Medical Director of the Center for Functional Medicine at Cleveland Clinic. Can Pomegranates Really Help You Live Longer?